Dr. Bryan Schuetz, The Columbus Chiropractors at Capital City Chiropractic. Before we go too far into this discussion, we should define the term, “arthritis,” which means joint (“arth-“) swelling (-itis). Simple enough, right? Wrong! Without getting too complicated, we must realize there are MANY different types of arthritis such as osteoarthritis, rheumatoid arthritis, lupus, gouty arthritis, psoriatic arthritis, etc. To narrow this down a bit, we will limit our discussion to osteoarthritis, also known as degenerative joint disease. This occurs because we literally cannot control the speed of the head as it rapidly moves forwards and backwards upon impact and it’s all over within 600-800 milliseconds! 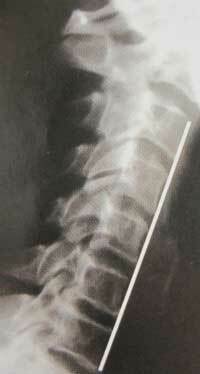 Since we can’t voluntarily contract a muscle that fast and when joints move beyond their normal stretch length, the ligaments – those non-elastic, tough tissues that securely holds bone to bone – will only “give” so much and then tear, which is technically called a “sprain.” This leads to an accelerated rate of degeneration and eventually arthritis neck pain. Blood tests are negative with DJD (unlike many of the other types of arthritis), and an x-ray can help determine how “arthritic” the joint is and whether the smooth, silky ends of the joint (called hyaline cartilage) are worn down and if bony spurs are present. In the neck, DJD can create a lot of symptoms which may include pain and stiffness, especially in the mornings after laying still and not moving during the night. 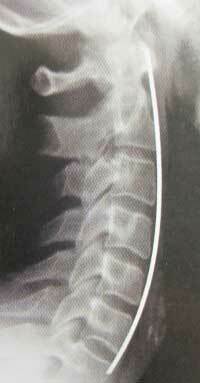 This is an X-Ray of a normal cervical spine. You can see that it has a 60 degree curve that allows the weight of the head to be distributed to the posterior joints. 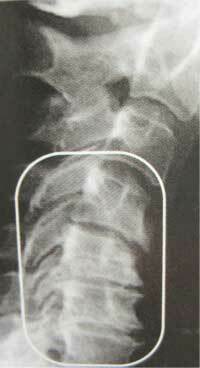 Here is an example of a cervical spine that has lost its normal curvature from poor posture, fall, or auto accident. The weight of the head is transferred forward and is compressing the spinal discs.